Wonder Woman, the latest DC Universe DVD/Blu-ray from Warner Bros. is available to now available to own. But I’ve got a few more images and a brand new Q&A with actress Keri Russell, who voices Diana/Wonder Woman, worth checking out. Click through the jump to read the Q&A and see two more images. 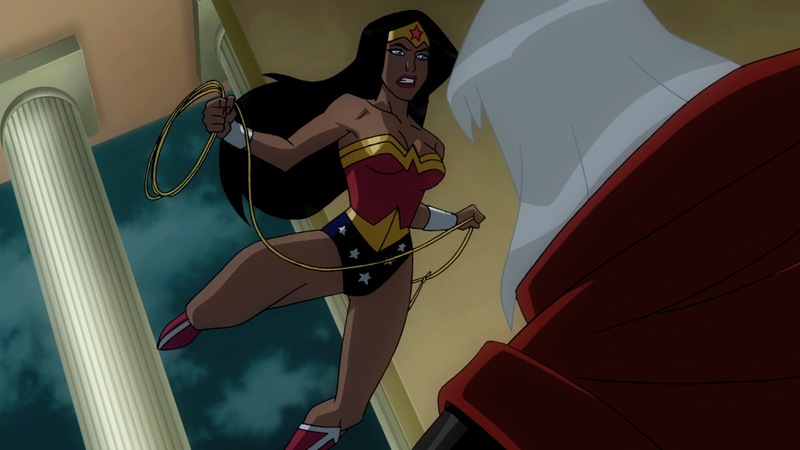 Produced by the multiple Emmy® Award winning animation legend Bruce Timm, Wonder Woman is an origin– story and features a stellar celebrity voice cast including Keri Russell (Waitress, Felicity), Nathan Fillion (Desperate Housewives), Alfred Molina (Spider-Man 2), Virginia Madsen (Sideways), Rosario Dawson (Sin City), Oliver Platt (The West Wing) and David McCallum (NCIS). Wonder Woman begins on the mystical island of Themyscira, where a proud and fierce warrior race of Amazons resides. They have raised Princess Diana, a daughter of stunning beauty, extraordinary strength and incredible fighting prowess. Diana possesses a host of super human powers granted to her by the gods and goddesses of Olympus and her strength and stamina are unparalleled. When Air Force fighter pilot Steve Trevor crash lands on the island, the rebellious and headstrong Diana defies Amazonian law by accompanying Trevor back to civilization. Meanwhile, Ares (the God of War) has escaped his imprisonment at the hands of the Amazons and has decided to exact his revenge by starting a world war that will destroy them all. It is up to Princess Diana to save her people and the world by using her gifts to become the ultimate Wonder Woman.